Company logos at the super-sized Wawa convenience-store-and-gas-station combo at 2535 Aramingo Avenue in Philadelphia. First, Amazon came for your bookstore. Then for your electronics store, department store, and supermarket. 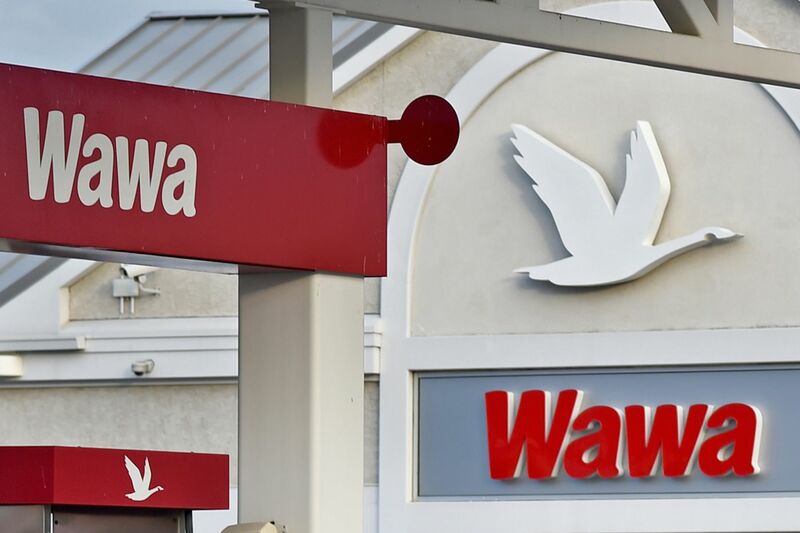 Now, it seems, the online retailer run by multibillionaire Jeff Bezos may be coming for your Wawa, too. Word that the Seattle-based company had been lobbying the Kenney administration to clear a path for its Amazon Go convenience store chain in Philadelphia shows how real the threat of the company’s newest business venture is to our region. The lobbying efforts revealed this week are unsurprising. Of course Amazon would attack legislation banning most cashless stores. How else could Bezos open stores that use no cashiers and allow only digital payments for merchandise? But this is what we should all be most in awe of: A win-at-all-costs company is taking on a convenience-store market in which Wawa has, up till now, grown into a major employer and regional benefactor out of its suburban headquarters. Many locally run companies have unraveled in recent decades. The idea of a potentially weakened Wawa is terrifying. This isn’t about sentimentality. It’s about dollars and cents and people’s livelihoods in an economy that is pushing ever more workers to the margins. Wawa underwrites more than 10,000 desirable jobs in Southeastern Pennsylvania and South Jersey alone, among 33,000 overall on the East Coast. They are jobs in stores that have cashiers and sandwich makers, whereas Amazon Go uses no humans at checkout and sells only prepared, packaged food. As many as 3,000 Amazon stores could be up and running nationwide by the end of next year. Given what the online retailer has done to shopping malls and small shops alike, gutting over-the-counter jobs for warehouse and delivery jobs, imagine what Amazon Go could do to Wawa, whose stores are a way of life in our neighborhoods. Investors have such faith in Amazon’s new venture that one estimate this year by RBC Capital Markets forecast that Amazon Go could vacuum $4 billion in sales by 2021, once all of its stores were rolled out. One industry watcher I spoke to by phone this week from a Florida conference on convenience store “disruption,” no less, said Amazon is on everyone’s minds. Some have downplayed the threat, while others are watching very carefully as Amazon Go is being rolled out. “There’s probably a red flag that should go up in more people’s minds about this,” said Steve Holtz, who oversees reporting for convenience store industry trade publications under the CSP name. Sure, Wawa is a hometown favorite. The Delaware County company had been a longtime fixture in the dairy business before it opened its first convenience store in 1964. Its name is now synonymous with Philly, and its stores are as much a part of neighborhood life as post offices were before the internet age nearly put a fork in them, too. But Wawa is so much more than a feel-good name that keeps us caffeinated in the morning and inhaling made-to-order hoagies at lunch. Wawa is a high-quality employer at a time when low-skilled workers are struggling to find work that can support a family over the long haul. What Wawa offers is increasingly rare in our haves-vs.-have-nots economy, and in a retail sector where the talk in recent years is about cutting costs to compete with — you guessed it — Amazon. Wawa has built a reputation for hiring workers at good wages and then not treating them like a disposable cog in an 800-store machine up and down the Atlantic coast. My colleague Signe Wilkinson recently conveyed her own consternation by placing a head of Bezos onto a dummied-up dollar bill of her own editorial-cartoonist imagination. “In Billionaires We Trust,” her greenback scathingly proclaimed. My version, if I could draw, would say this: In Wawa We Trust. Because Wawa has earned it.